I’ve been the work experience placement at the wonderful National Museums Collections Centre in Granton for the last surprisingly short five days. For four days I’ve been based in the Collections Centre but on Tuesday I was in the National Museum of Scotland itself. If you – yes, you! – haven’t been yet, then you should go: the Museum is amazing in size and structure, and magnificent in its collection content, as, including the reserve collections, they have over four million objects and counting, in case you were wondering. After arriving at the National Museums Collections Centre on a rather cold and dreary morning, what struck me at first was the very friendly and warm welcome from the staff at the Collections Centre. I thought it would be full of people who were going to be depressed and stocked up on way too much caffeine, but no, there was a surprisingly happy atmosphere for a Monday morning and some genuinely nice people too! I was given the tour of the Collections Centre buildings (only five currently contain collections, as some of the older buildings are being demolished to make way for a shiny new storage building) and I was startled by the sheer size of the site. I’m not exaggerating when I write that it’s huge. When I first walked into Building 14 (the first building in the tour of the site), I was overwhelmed by the vast size of it; the buildings were all like the TARDIS. I was quite unresponsive throughout the rest of the tour because I was speechless! 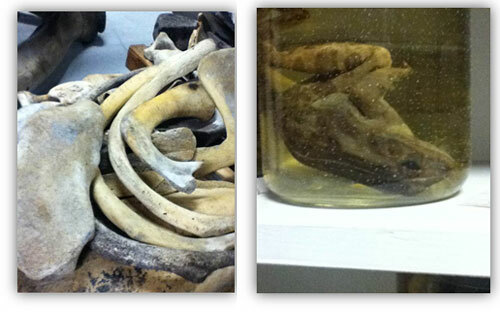 From whale bones to frogs pickled in jars the Collections Centre has it all. 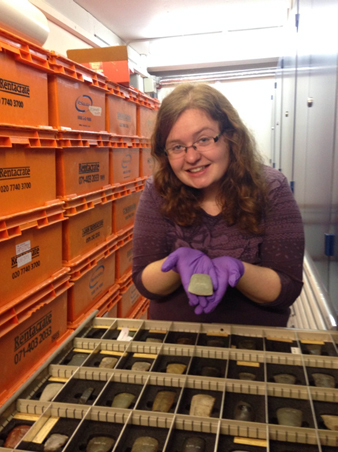 In the afternoon, I learned how to handle the artefacts with the care that they require. I found it amazing how close conservators get to objects. I was able to see these objects from a conservator’s point of view, so with that came an almost overwhelming sense of responsibility. After that I knew that my work experience week was never going to be ordinary. before getting close to real objects. Tuesday entailed a different venue to explore: the Museum itself on Chambers Street. I was given a tour of this site: mind-blowing isn’t it? It’s hard to take in the actual age of some of the objects: when I was shown the Early People section of the Museum it was very difficult to think that the objects on display are over thousands, if not millions, of years old. From the terrific T-Rex to the amazing amethyst geode, the range of collections of the Museum are spectacular. 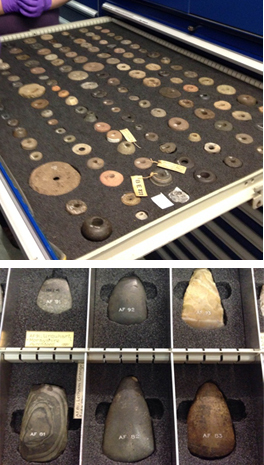 On Tuesday afternoon, I was taken to the Loans and Collections Development departments, where I learned how objects are loaned and transported to and from the Museum, such as the current Vikings! exhibition, which is mostly on loan from the Swedish History Museum in Stockholm. I was also shown the ADLIB database, which contains information on most of the objects in the collection and their whereabouts. I found this very intriguing, especially the amount of work the system actually requires. You need to enter information about each component part of an object individually, for example, a teapot and its lid have separate object records. Half way through the week, Wednesday involved looking at artefact conservation and paper and textile conservation back at Collections Centre HQ. In the morning with the artefact conservators, I looked at how to conserve objects and the various different methods which can be used. It was incredible how varied their work can be. One day they’ll be working on some taxidermy, the next day they could be working on some objects made entirely of glass. It also struck me how precise you have to be in this work: a mistake could mean that an irreplaceable object is damaged beyond repair. The afternoon entailed learning about the conservation of Paper and Textiles. The fragility of these objects is unbelievable, how they survived centuries of different owners and conditions is something I can’t understand. I made a padded hanger (which I think I made rather clumsily). These help to conserve clothing. They stop any acid within the wooden hangers from damaging the textile, and also support the costume seams. I was able to use my hanger on a piece of clothing, (after three attempts with different outfits) we found it fitted into a beautiful pink dress covered in small flowers which had a great level of detail and accuracy. Third time lucky; the padded hanger fits! Thursday’s tasks included some work in the Analytical Research labs and a look at the conservation of different works of Engineering. I was very excited about Thursday morning as Analytical Research is in some ways similar to what I want to do when I’m older: forensic anthropology. It didn’t disappoint. With the Analytical Scientist, I looked at different ways to analyse objects to find out many different things. It was a great insight into the way we understand objects. Engineering conservation was very interesting in the afternoon. I was shown around another section of storage in which there were contraptions of all kinds. It was great to see that many of the items in storage still actually function. 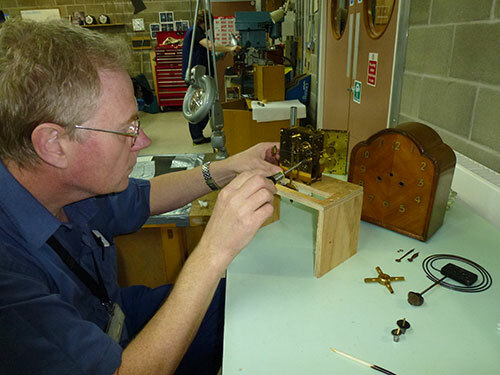 Some of the objects come into the Collection Centre in pieces, and some of the time the engineers have to guess what they would have looked like, which requires a great deal of patience. They then rebuild the object, and to see the finished piece is amazing. 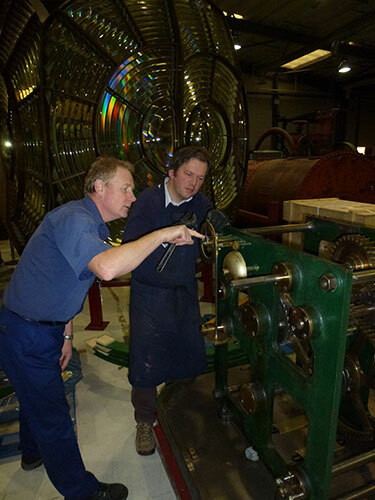 It’s rare to get the chance to see behind the scenes at Granton, so keep an eye out for any opportunities that come up, like Doors Open Day last year. Cars and carriages in the National Museums Collection Centre. My fifth and final day at the National Museums Collections Centre included a look at ways that objects from the collections are photographed. I saw the range of objects that photography has to work around and I can tell you now, it’s not a walk in the park! Glass particularly is difficult. The photographers have to work around so many different objects and take photographs with a great deal of care. They also have to work with many different camera angles, and work with a high level of accuracy. It was very intriguing, but I don’t have a very high level of patience so I found it quite trying to get the perfect angle for an object. So that’s it for my round up of my week here at Granton. It was a great experience and an unmissable opportunity. It was good to work with such great people and I am so lucky to have gotten the chance to work here. Hopefully, this blog gets your ‘seal’ of approval! On Saturday 22nd September a happy band of museum curators, conservators and collections managers led groups of visitors around the National Museums Collection Centre as part of Doors Open Day 2012. In preparation for this I was asked to show STV reporter Laura Piper around the site. You can see the report from the day on the STV website here. Doing that visit got me thinking about my job and led me to declare “I’ve got the best job”. In my new role as Head of Collections Services I am based at the Collection Centre and this means I am surrounded by millions of fantastic objects and specimens and work alongside an incredibly talented team of people. 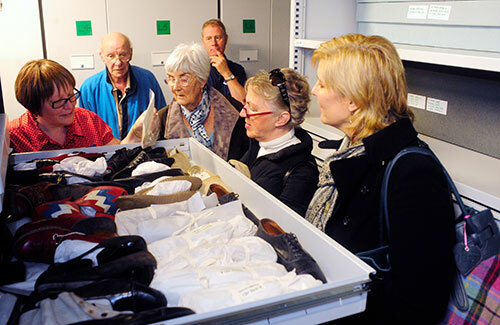 Wendy shows off some of the shoes in our collection at a previous Doors Open Day. 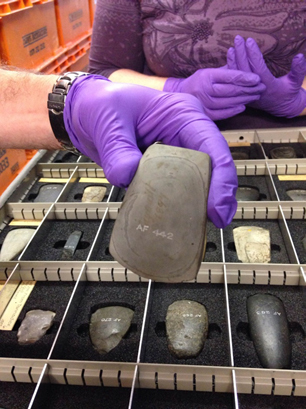 At the Collection Centre we research, conserve, preserve, and photograph the collections, preparing them for exhibitions at our other sites and for lending them in Scotland, the UK and internationally. Our excellent facilities enable researchers and visitors from across the world to come and study our collections. Since the mid 1990s we have been developing the site, constructing state of the art buildings to house our collections in. Most recently we constructed a new building to house the collections that had been stored in cramped and challenging conditions in the basement of the National Museum of Scotland. We’re now working on designing another new building to house some of our collections which are currently stored off site. 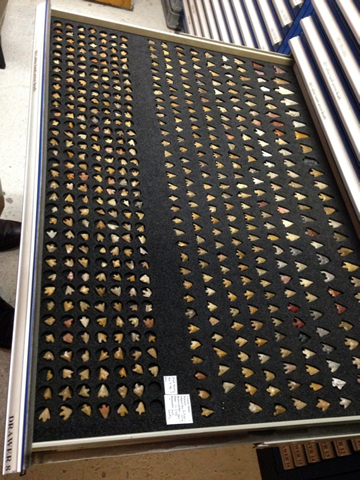 This work supports us in regenerating our displays and is helping us to improve access to our reserve collections. I’ve worked for National Museums Scotland for over twenty years and as I say in the video every day is different and that’s why I think I’ve got one of the best jobs in the country. See photos from the day and hear Wendy’s commentary in the video below, reproduced here with the kind permission of STV. 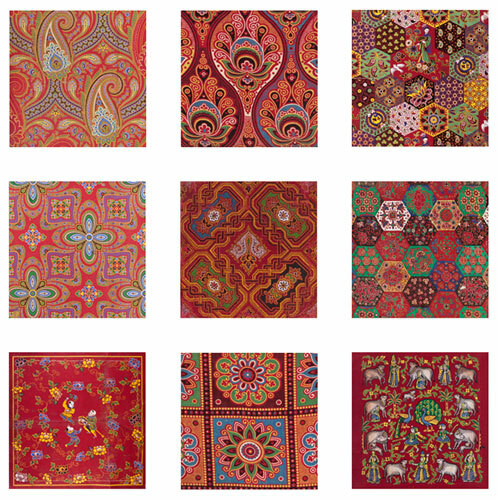 Additional text by Sally Tuckett and Stana Nenadic from “Colouring the nation”, a new in-depth study of the Turkey red pattern books in the National Museums of Scotland. Textile History (Forthcoming 2012/3). Working with Dr Sally Tuckett from Edinburgh University I was given the task of photographing examples of Turkey red for an online exhibition hosted by National Museums Scotland. Due to the specific nature of the samples colour accuracy and continuity were of paramount importance to the cataloguing of this collection. 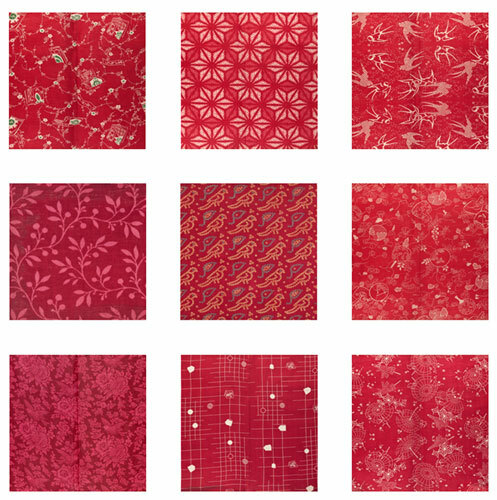 The production of Turkey red dyed and printed cottons was a major industry in the west of Scotland, particularly in the mid to late nineteenth century. 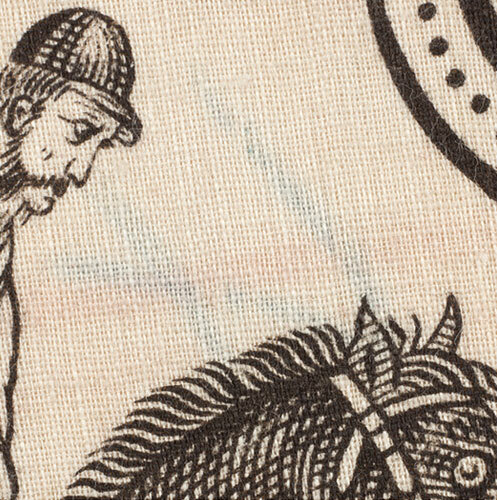 Although the extensive works were pulled down in the second half of the twentieth century, our knowledge of this industry is significantly aided by the survival of approximately 200 pattern books, now housed in the National Museums Scotland textiles collection. These pattern books are the foundation for a new study into the wider Scottish decorative textile industry. 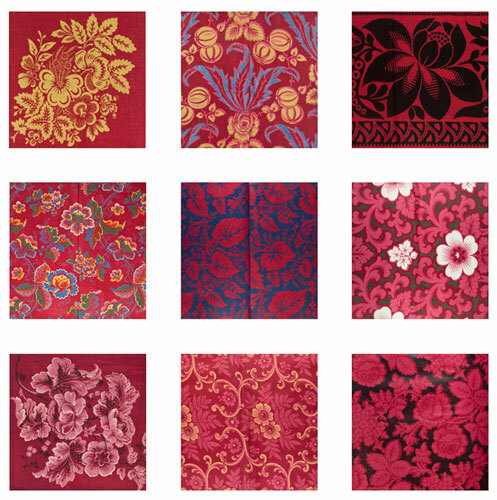 The ongoing examination of these pattern books has shown the variety and longevity of Turkey red dyed and printed patterns, as well as providing insights into wider aspects of the textile industry, including issues of design, manufacture and trade. The production of a colour-fast red dye that could withstand frequent washing and sunlight was a long-standing ambition of dyers in eighteenth-century Britain. Called ‘Turkey red’ because it originated from the Levant region, the original process, which was time-consuming and expensive, was based on the extraction of alizarin from the madder root, which was then fixed to the fibre using oil and alum, as well as a host of unsavoury ingredients such as sheep’s dung, bullock’s blood and urine. 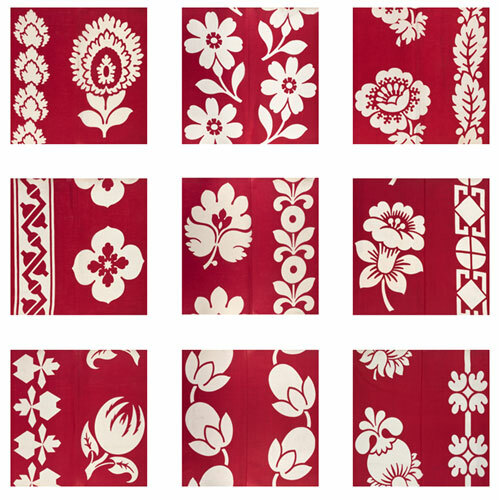 Manufactured in millions of yards and in a huge variety of designs, few of these colourful textiles survive today, other than in the form of samples and designs in pattern books. 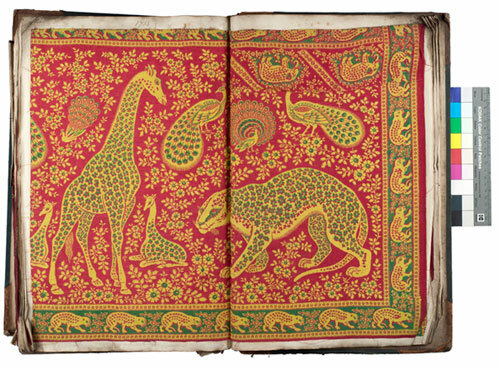 Historians of textiles and dress have long recognized the importance of pattern books as sources. Pattern books were kept by manufacturers as records of their designs, manufacturing processes or orders. 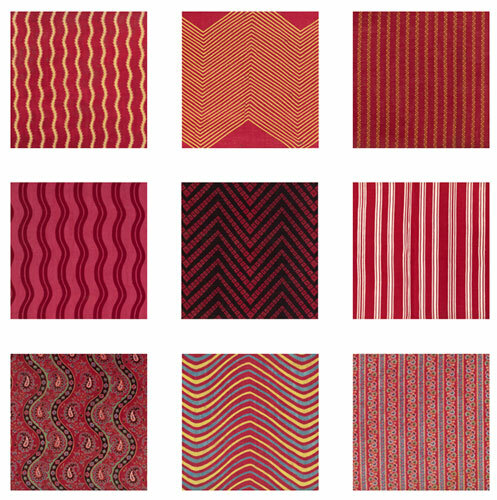 The National Museums Scotland Turkey Red Collection consists of 200 bound and unbound pattern books. 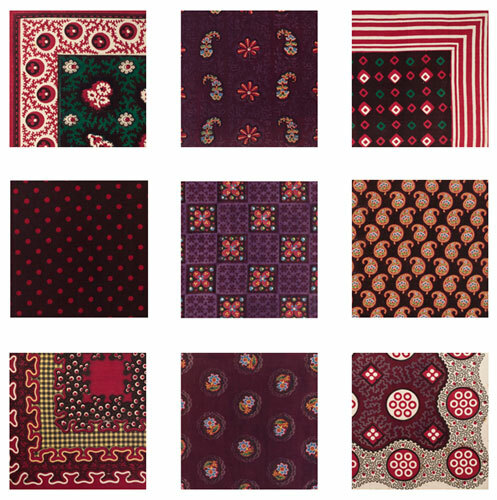 In all there are approximately 40,000 items in the collection, consisting of Turkey red dyed and printed cotton samples. The condition of the pattern books and the individual samples vary considerably. These were accessioned to the National Museums Scotland collections in the 1960s on the demise of the United Turkey Red Company in Scotland, and have been largely untouched ever since. 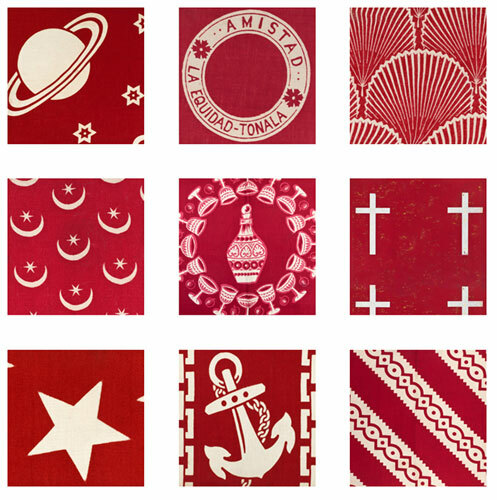 Turkey red printed fabrics were rarely encountered in everyday life in Britain other than by the industry’s workers, as the large proportion of goods were for such markets as Australia, New Zealand, Brazil, West Coast of Africa, East Asia and India. 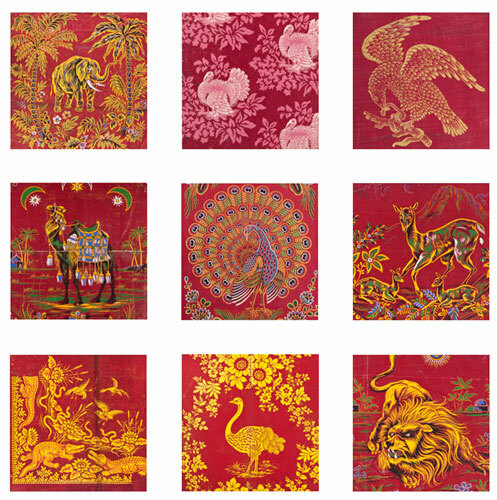 Many of the animals present in the designs represent the wildlife native to these export markets. 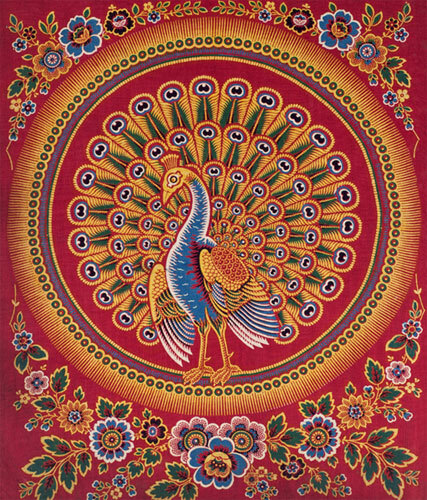 Turkey red patterns featuring exotic animals and birds. 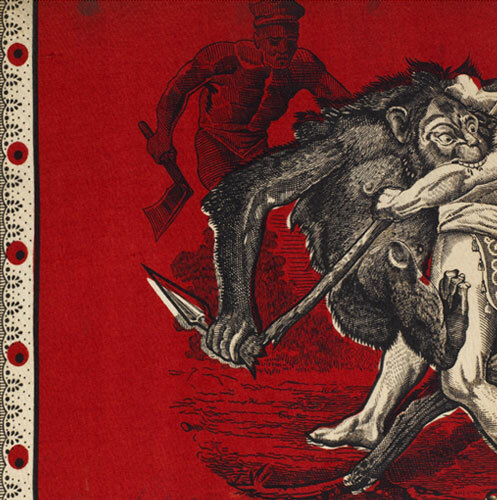 The Turkey red dyeing and printing industry in Scotland was concentrated in the Vale of Leven, Dunbartonshire. 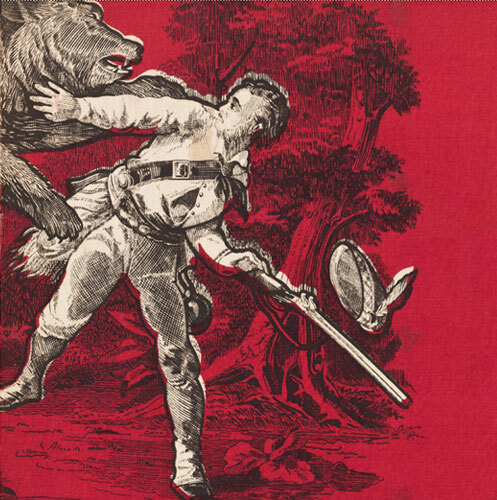 William Stirling and Sons established themselves as Turkey red printers in the early nineteenth century. 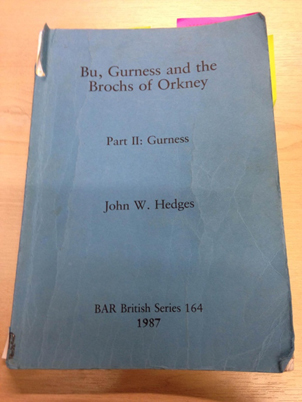 Their main rivals in the Vale were two firms run by brothers, John Orr Ewing and Co. and Archibald Orr Ewing and Co.
Competition between the Vale of Leven firms was brutal, with much copying and theft of designs among the rivals. Knowing that such design espionage existed makes it harder to definitively say if a pattern book belonged to one or another firm. On present research, just 41 per cent of the National Museums Scotland volumes can be securely connected with a specific Turkey red manufacturer. In 1898 William Stirling and Sons, John Orr Ewing and Co. and Archibald Orr Ewing and Co., along with Alexander Reid and Sons of Milngavie, amalgamated to form the United Turkey Red Co. Ltd. (UTR). 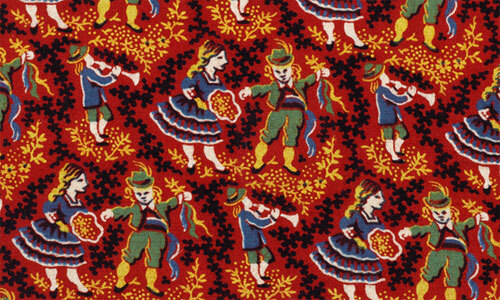 Pattern featuring dancers and musicians. Having set up a temporary studio in building 15 at the National Museums Collection Centre, great care was taken with lighting and exposure to ensure consistent and accurate results whilst photographing a collection of samples that varied greatly in size, condition and colour. 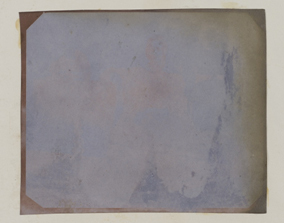 Each sample was photographed with a colour chart, and a strict colour management work flow was set up to insure the digital processing of the images would maintain the colour integrity of the original sample. Turkey red pattern book with colour chart. The large files that we can produce show a level of detail within the design that is not always apparent to the naked eye. 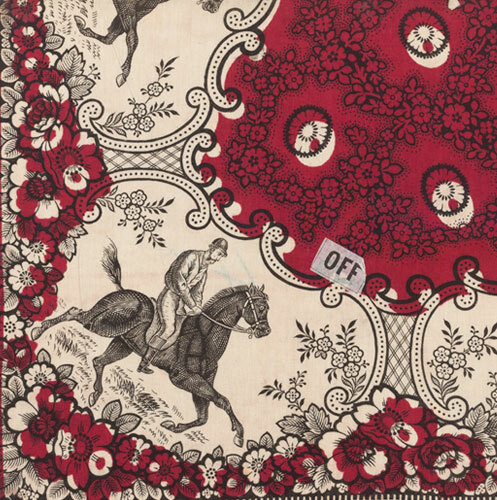 Turkey red pattern with a horse and rider. Using extension rings on the lenses allowed us to produce extreme detail within the images, to the point where you can almost count the individual threads of the fabric. Individual threads in a piece of Turkey red fabric. The National Museums Scotland patterns books, particularly when the details they contain can be linked to other sources, are yielding a more subtle understanding of the Turkey red textile industry in Scotland than was formerly possible, showing us the rich and diverse character of this little understood industry. This joint project between National Museums Scotland and the University of Edinburgh is intended to bring a wider understanding of an aspect of the Scottish textile industry which had a global impact. For further information about the project please visit www.colouringthenation.wordpress.com. 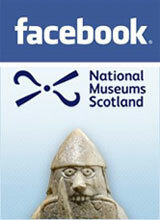 Keep an eye on the National Museums Scotland website for more information on the online exhibition, due in 2013. 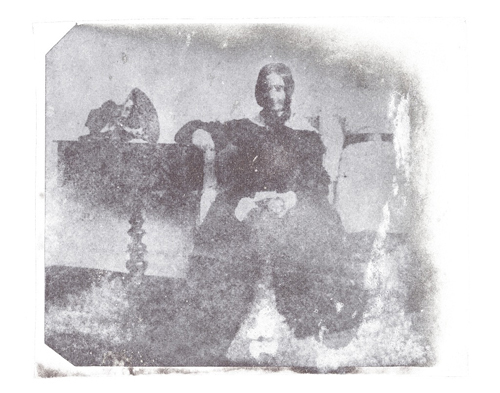 Have you ever wondered who or what is lurking behind a faded photograph? 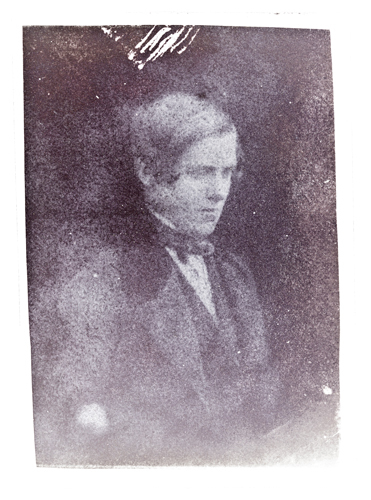 The photography section at National Museums Scotland is currently digitising our museums collection of pioneering calotypes from the two albums that belonged to Dr John Adamson, elder brother of Robert Adamson, of the famous early photographic partnership of David Octavius Hill and Robert Adamson. These calotypes consist of a paper negative original (no longer present) which is then contact printed onto a fibre based paper to produce a positive image. During the photography process I became aware that many original images had faded to either a blank sheet or a very faint outline. Although it is important to photograph the images as they now appear, the need to know what was originally photographed is compelling. Because the chemical dyes in these faded originals are so washed out and the fibre paper is quite irregular, a process of shining light through the paper to enhance the images was not a suitable solution. During experimentation I discovered that using a combination of Photoshop and Lightroom techniques, image enhancements were possible. 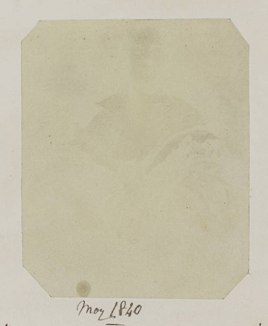 I have discovered that this digital conservation process can be repeated for all relevant pictures in this collection. And so the discovery begins. 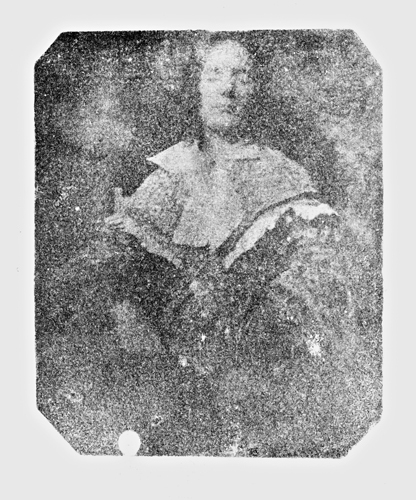 The same image (reverse positive) after digital conservation reveals a portrait of a woman. 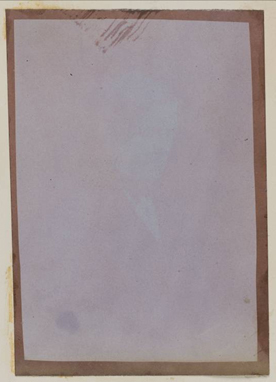 The image after digital conservation reveals a portrait of a man. 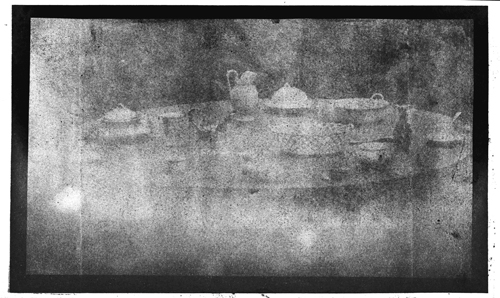 The image after digital conservation reveals a table set for tea. As you can see, the original tone is not always preserved. This is because, as part of the enhancement process, I am selecting localized colour tone and density and gaining detail and contrast. During this procedure tones will be sacrificed for definition gains. Also at this stage the image’s visual enhancement process is superseding the retention of colour. Further developments will include the retention of the original’s appearance. 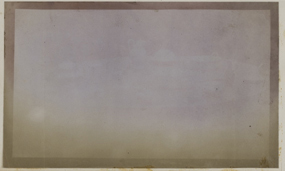 So far in this development, people and objects have been discovered: the likelihood that the subject matter in these photographs has not been visible for over 100 years. We don’t yet know who these individuals are or where the objects were photographed. However, in addition to our collection, many other collections of photographs exist from the dawn of photography during the 1840s, the Hill and Adamson era, and the answers to these questions may lie there. How can museums share their collections with as many people as possible without access to much-needed financial resources or staff time? 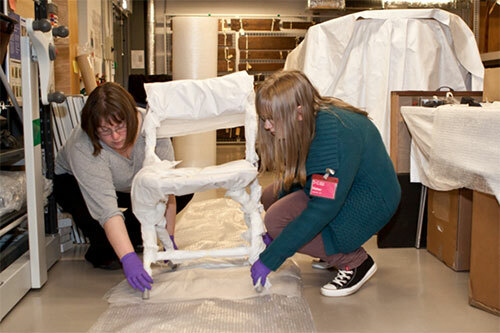 This was the exciting challenge faced by a steering group within the Fife Museums Forum, a collaborative network for museum professionals working in museums across Fife, charged with the task of publicising member museums and their diverse collections. Following the example of leading museums, including National Museums Scotland and the V&A, we decided to reach out to museum audiences by embarking on a project to create a Flickr photo-sharing group for the Fife Museums Forum. At the outset of the project, we were aware that members of the Forum had very varied levels of experience of photography and using social media. In order to ensure the success of the project, we would have to provide some form of training and support on both counts. We got in contact with Megan Combe, National Partnerships Officer at National Museums Scotland, who very kindly offered to arrange a workshop on ‘Studio Photography for Social Media’ as part of the Knowledge Exchange programme. As part of their Responsive programme, the workshop would be in partnership with the Fife Museums Forum, but open to anyone outwith the Forum who had a real need for the course. 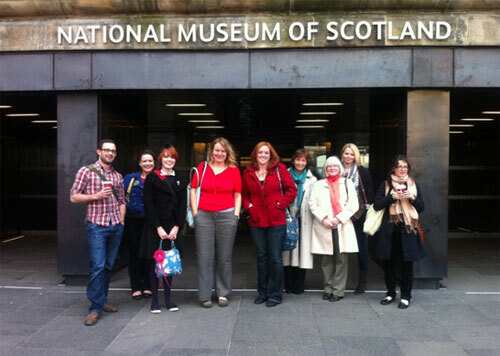 On 27 September representatives from museums across Fife, from Dunfermline to St Andrews, left the Kingdom and travelled to Edinburgh ready to be let loose on the world of social media and photography! In preparation for the afternoon training session, Megan had asked attendees to dust off their cameras and practise their photography skills by taking a few shots of museum objects. Armed with cameras and a lot of enthusiasm, representatives from the Forum thought that it would be a good idea to combine our ‘homework’ with a visit to the newly-redeveloped National Museum of Scotland. 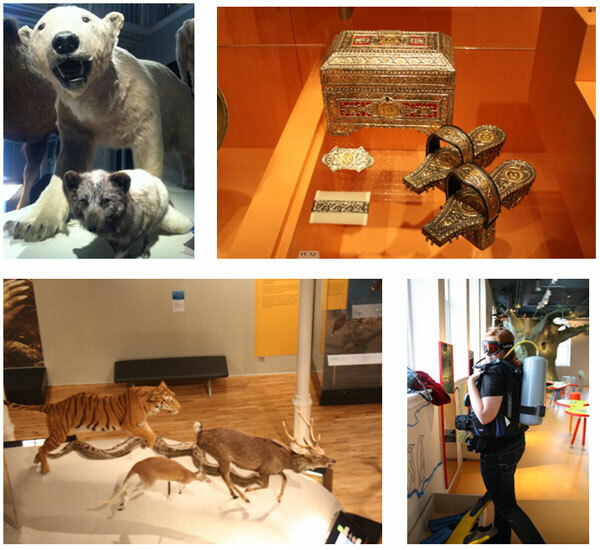 We enjoyed exploring the galleries and taking photographs of some of the fascinating objects on display (and even had time to sample one of the National Museum’s new cafés)! A quick group shot before heading inside to explore the National Museum of Scotland. Representatives from member museums of the Fife Museums Forum: the Carnegie Birthplace Museum, Dunfermline; Kirkcaldy Museum, Fife Council, Kirkcaldy; Scottish Fisheries Museum, Anstruther; Museum Collections Unit, University of St Andrews, St Andrews; and the British Golf Museum, St Andrews. A small selection of some of the photographs taken by the Fife Museums Forum. After travelling to the National Museums Collections Centre at Granton, we joined colleagues from Verdant Works, Dundee and East Lothian Council Museums. Megan Combe then introduced us to Elaine Macintyre, Digital Media Content Manager, and Neil McLean, Photography Manager, who were to lead the afternoon session. They shared with us some handy tips on museum photography and digitisation, including lighting and camera techniques. We also learned about online photo applications and some good examples of photo-sharing projects. In response to some of our member’s concerns about the possible loss of rights over images published online, Neil and Elaine gave some very useful advice about the management and use of digital images in social media. This was followed by a very informal discussion session where attendees could ‘ask the experts’ any questions that they had about digital photography and social media. 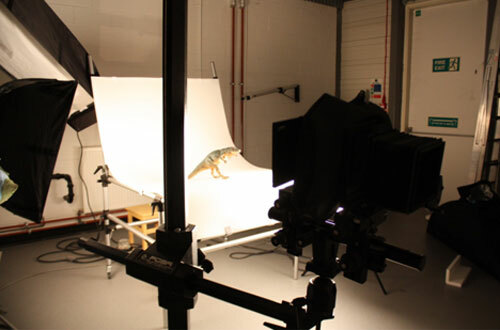 We also had the very exciting opportunity to see ‘behind the scenes’ in the Photography Studio at the Collections Centre. Neil gave us some very helpful and honest feedback on how we could have improved some of the digital photographs (of varying quality!) that we had taken in the Museum earlier that day. 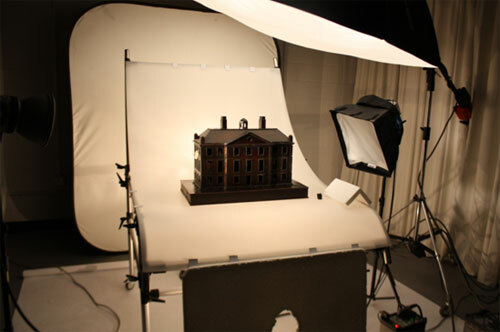 It was also very useful to find out how to take good quality photographs of museum objects without having a professional photographer’s studio and using inexpensive materials, such as large rolls of coloured paper and table lamps. Photography studio at the National Museums Collections Centre at Granton. As a result of the Knowledge Exchange training session on ‘Photography for Social Media’, representatives from our member museums have been provided with the knowledge, skills and confidence to both participate in and take forward the Fife Museums Forum Flickr photo-sharing project. Since the Knowledge Exchange training session, members of the Fife Museums Forum have been avidly taking lots of snaps of their museums’ collections to include on the Flickr page. Equally importantly, our visit to National Museums Scotland and the Knowledge Exchange training session provided representatives of the Forum with a great opportunity to meet with and share experiences with museum colleagues from across Scotland. It was a great day out! We would all like to thank the National Partnerships, Digital Media and Photography teams at National Museums Scotland for all their support and assistance with this project. You can view the forum’s efforts at their new flickr group www.flickr.com/photos/fifemuseumsforum.